Galapagos should remain “a once in a lifetime trip” – Sir David Attenborough. Living on such a rare opportunity on earth, it is no wonder that Galapagians are some of the most self-aware of isolated island communities. In the tense detachment between the slowness of island live and the current of 3-5 day cruise-trip tourists, photography has become a platform of exchange that nearly all conversations surround upon. Our naturalist guide taunts me while we travel for 2 hours by boat just to capture the mars-like landscape with the few sparse cactus and iguanas that reinforces with any google image of the search term “Galapagos Islands” (more on this later). To counter this misrepresentation, I proposed to record this “Galapagos Culture” with much excitement from the local community. There are 2 radio stations in the Galapagos Islands. Radio Encantada broadcasts from a simple office much anticipated news and music to all the islands and sub islands. I peeped through their window and was warmly shown around by the presenter. It seemed that I found a comrade in my mission to present the Galapagian culture, as I receive my a parcel of Christmas sweets from the station owner and producer. 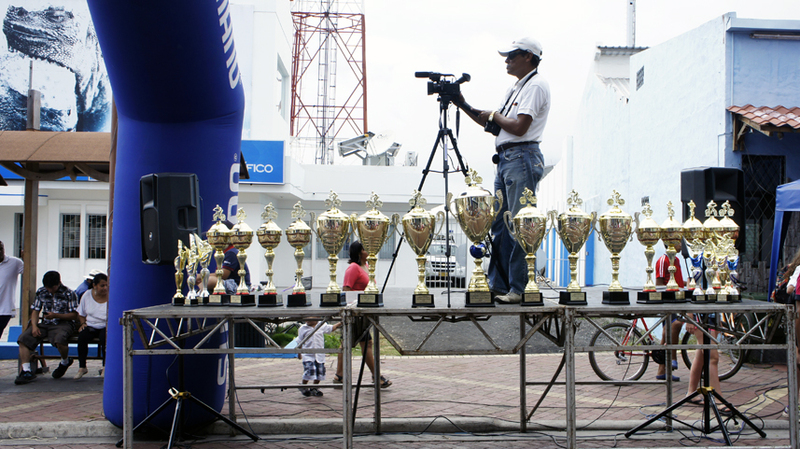 Today, Radio Encantada was reporting on the tour de Galapagos, a bike race for children. Escorted by Police cars with a blazing siren (and an officer filming the wining team from the back of the truth with his samsung camera phone), the race brought all the locals of the Santa Cruz area together. The award ceremony took 4 hours and there was almost a trophy for each participant. Still, I can appreciate what a special memory it must to win a prize, even if everyone is a winner. 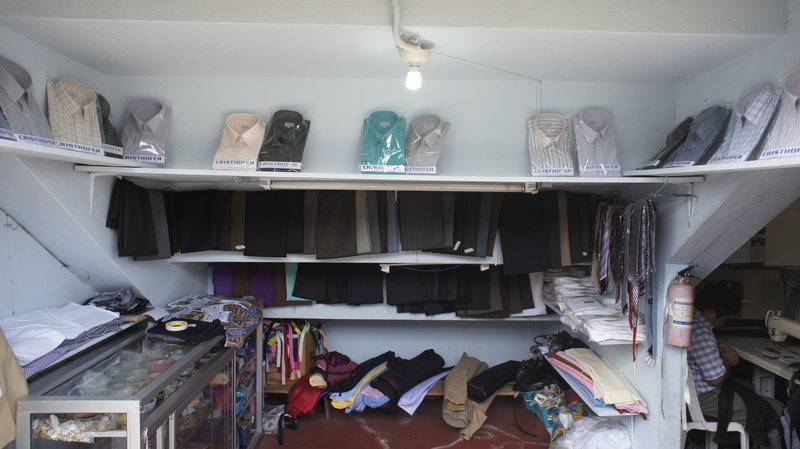 In the shade from the heat, the only shop opened near the school was the uniform shop. This is the last think I’d expect to be open in the holidays between Christmas and New Year, until I saw the tireless workers in the back room with their sewing machines drumming at top speed. Everyone was making last-minute adjustments for the choreographed school show. At night, the local school put up a banner saying “A present from God for you”, making the public square next to the harbour into an instant out-door theatre. I wove in and out of the crowd like an annoying paparazzi and was much surprised when the headmaster instructed staff as well as children to move out of my frame. I started to become conscious of just strategic the setting was, of using foreigners such as myself to broadcast the under-represented cultural activities here. While pondering on this, one of the teachers rearranged a few papier-mâché camels that I was photographing, amusing myself at the thought that camels would be very invasive animals here. It wasn’t very witty, especially if I tried to explain it, but that wasn’t the point. Before I knew it, they had pulled over a bewildered school child to pose amongst the papier-mâché camels for the convenience of my one-touch-click. I’ve been told that camels have one of the longest memory of all animals. This paper camel will be in my digital memory forever.